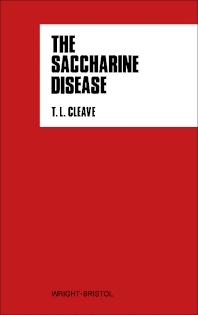 The Saccharine Disease, Conditions Caused by the Taking of Refined Carbohydrates, such as Sugar and White Flour contends that the causation of these conditions has been obscured through confusing distinctions between unnatural, refined carbohydrates and that of natural, unrefined carbohydrates like fruits and whole meal flour. The author notes that all the foregoing conditions are really the manifestations of a single master-disease—that many of the major diseases of modern societies are caused by consuming unreasonable amounts of refined carbohydrate foods. The author discusses that in the short time that man has changed his diet, evolutionary adaptation is left behind. He gives two rules to prevent and arrest all saccharine disease manifestations: Do not eat any food unless you definitely want it, and avoid eating white flour or white sugar. These two rules will prevent gastric or duodenal ulcer, diabetes, coronary disease, constipation, complications of varicose veins, hemorrhoids, E. coli infections, obesity, and some skin conditions, As a retired Surgeon-General of the Royal Navy, the author bases his assumptions on evolutionary, epidemiological, and other scientific or historical work. This book can give insights to dieticians, food researchers, nutritionists, people on diet, and general medicine practioners.